We are well known manufacturer and exporter of various kinds of pallets. We provide economic range of steel pallets made from high grade material. These single deck steel pallets contain one side entry. The pallets for forklift and stackers have two or four side entry. The two way entry type pallets are used for heavy duty racking system. We possess advance level of manufacturing facilities. 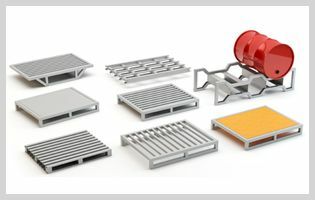 Our team of experienced professionals has the ability to customize the steel pallets as per need. Our high production set up facilitates the fabrication of world class steel pallets. Our end product passes through stringent checking from procuring of the material to dispatch of the final product. We provide these pallets with high load bearing capacity from up to 3000 Kg UDL.